I make pasta dish maybe once a week or less often and this is always one of those meals I cook when I don’t want to spend too much time in the kitchen and want dinner on a table in half an hour or less. 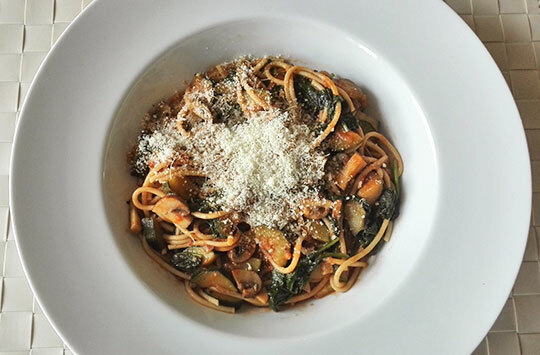 I invented this pasta recipe one week when I had some random vegetables to use up in the fridge and I just wanted to make something quick and simple. So I thought I would make a vegetarian pasta using mushrooms, courgette and spinach, these were all the random vegetables I needed to use. 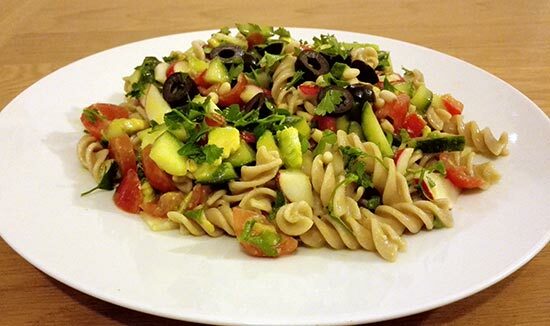 The beauty of this vegetarian pasta is that it is so quick to make as vegetables cook pretty quickly as opposed to meat. While pasta is cooking you prepare the sauce and dinner can be ready in less than 20 minutes. 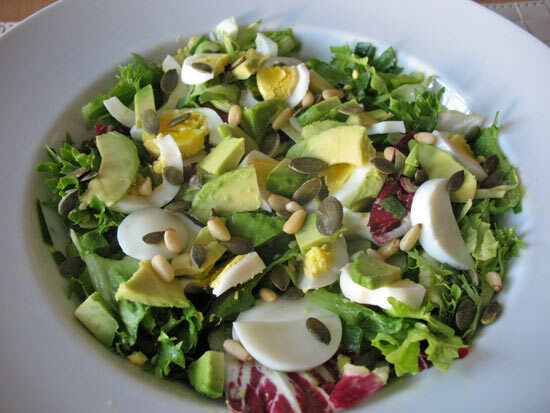 Who doesn’t want a simple and quick dinner which is pretty healthy and easy to make? In this recipe I used chestnut mushrooms, but you could use any mushrooms you like. The quantities are approximate and you could easily make a meal for two out of them, just use some more mushrooms and more passata. I managed to make too much pasta for myself and I ate the leftovers the next day. 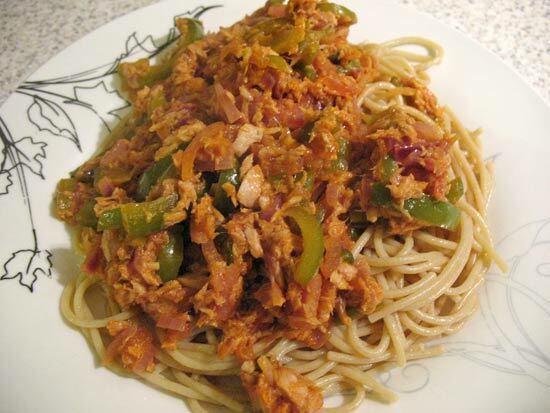 The pasta I used is wholegrain spelt spaghetti from Sainsbury’s but you could use other brown pasta if you like. One important ingredient of this pasta recipe, which you shouldn’t miss, is a parmesan cheese. 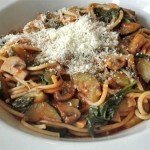 I just love grated parmesan cheese on top of the pasta, it makes the pasta complete and really delicious. I only buy this cheese once in a blue moon, as a treat, as it’s one of those cheeses I believe I should enjoy only once in a while, besides cheese can cause my skin to break out so I tend to avoid it. However, sometimes you have to enjoy yourself, as long as you are good most of the time. Everything in moderation, right? Prepare all the vegetables first: cut the onion and chop garlic; wash and slice mushrooms, cut the courgette and wash spinach. Boil the water in a medium size saucepan and add spaghetti to it which you cook for around 10 minutes. While pasta is cooking, prepare the sauce. Heat up the rapeseed oil in a tall frying pan and saute sliced red onion for 2-3 minutes before adding chopped garlic which you leave to cook for a few moments before adding a couple of tablespoons of water to prevent sticking. Add mushrooms, courgette and 1/2 stock cube and cover the pan to let the vegetables release their own water and cook in the steam. Add basil. Leave it to cook for a few minutes before stirring and covering with the lead again. Check again in 2-3 minutes to see how much water has evaporated. You want most of the water to evaporate, but not to the extent when it gets sticky. There has to be some liquid left before you add passata. Once you add the passata, cook the sauce for a few more minutes or as long as required, until the sauce begins to thicken a bit. This is when you add the washed spinach and cover the pan so that the steam could wilt the spinach. Finally you stir the spinach into the sauce and add salt and pepper, if required. Serve with some parmesan cheese on top and side salad.